When it comes to finding the right Charles City tree removal service for your Charles City home, it is never a good decision to settle for less than the best. Our team of Charles City tree removal experts at C.S. Flournoy are the team of professionals to trust when you are looking for the absolute best in terms of quality of work and quality of service. Over the past 30 years of providing our services to local home and business owners in the Charles City area, we have earned a reputation as a Tree Service in Richmond that puts our customers needs and desires first, and always makes sure a job is fully completed before we pack up and leave. Homeowners generally have a great deal of other projects that require their attention around their property, both inside and out, but many of these are only focused on the aesthetic aspects of the home, and ignoring some of the projects that could actually pose a serious threat to your home's safety. While trees do help to enhance the beautiful aesthetic of your home, they can also be a serious liability if they aren't taken care of properly and aren't trimmed back every so often, especially if a severe storm rolls through the area. Overgrown trees, especially if they are particularly large, can shed debris and branches onto the roof of your home, causing serious damage if the sections that break off are big enough, and unchecked root systems can actually force their way into your septic system and the plumbing lines of your home, leading to expensive repairs that could have been easily prevented. On a lighter note, if you are looking for tree trimming services just so that you can let more sunlight reach down to your solar panels, or you have started to notice that tree roots are beginning to tear up your patios, sidewalks, or pool decks, our team of professionals can come out and get the issue cleared up in no time. Give us a call today if you have any questions about our full line of tree removal and care services. 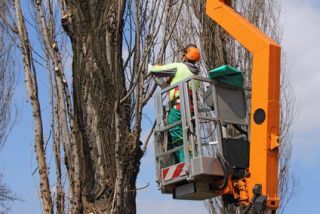 In some cases with the trees on your property, a simple trimming could be sufficient to sort out any issues, but sometimes you might need a complete removal. By working with a highly experienced professional like those at C.S. Flournoy, you can rest assured that you have an experienced pro on hand that can help you identify which trees only require a little bit of trimming, and which ones would be better of completely removed. We take a great amount of pride in the high quality services we are able to provide for all of our local customers, and our team of highly skilled professionals are always on hand to help. We will help you review all of your options before you decide on the exact service you are looking for to help make sure you get exactly what you need. Once your tree has been cut down and dragged off, there is still the matter of the tree stump to attend to. We can either remove this completely for you, or just grind it down so that it is no longer visible and then cover the area with grass and dirt. No matter which option you choose, we assure you that your tree stump will no longer be an eyesore on your property and you won't have to worry about it coming back down the line. If you are looking for a Charles City Tree Removal Company then please call 804-264-1000 or complete our online request form.